The stunning communal area at Sandibe. Enjoy unbroken views by candlelight. Design inspired by the scales of the pangolin. Al fresco dinning, African style. Elegant finishing touches in all suites. Spacious private viewing deck - complete with plunge pool. Gaze over the grassy planes from your pool. Natural colours and materials blend into the bush. 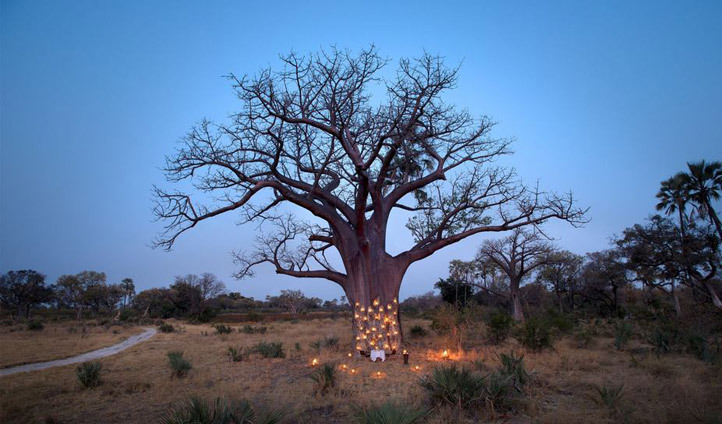 The best that Botswana has to offer, this beautiful bolthole raises the bar for stylish and sophisticated safari life. A far cry from canvas flaps and bucket showers, you can get back to nature while keeping a few creature comforts. Situated on the south-eastern Okavango Delta, in pride of place within a private nature reserve of almost 20,000 acres, the location of the Sandibe Camp was carefully chosen for its outstanding natural beauty and close proximity to some of the most wildlife-rich wilderness in this part of Africa, now a Unesco World Heritage Site. After a light aircraft transfer from Maun or Kasane, you can get straight into safari mode with a pleasant 45-minute game drive to camp. There are twelve suites at Sandibe, all raised on stilts above the ground to make the most of the stunning views, sweeping across the river and the plains. The rooms are intimate and spacious at the same time; nestled amongst the trees, decorated in light natural tones with vast open-plan living areas. Each comes with a private multi-level viewing deck complete with personal pool and outdoor shower. The rooms are beautifully designed with some neat finishing touches: we love the leather bean-bags and tree-stump coffee tables, and the copper basins in the bathroom. There is no question that Sandibe Camp occupies a perfect position as far as the wildlife and views are concerned, but it’s the amazing architecture and dazzling design that crowns the camp as the jewel of the Delta. 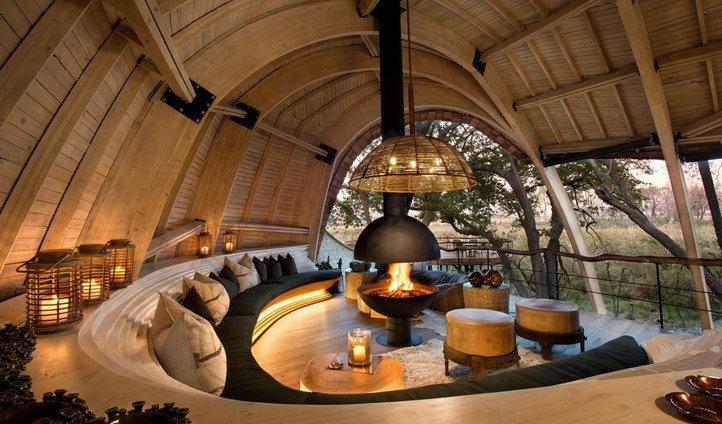 Inspired by weaver bird’s nests and pangolin’s scales, using free-flowing shapes, rustic tones and local materials to blend into the surroundings, this raises the bar for luxurious lodge living – topped off by five-star service and great game viewing.